Brusko Barbers is a JLT, Dubai-based concept barbershop that offers classic and edgy haircuts, clean shaves and excellent grooming services done by our professional barbers and hairstylists. We want everyone who comes through our doors to feel welcome and comfortable so they can have a great experience at Brusko Barbers. From our barbershop’s inventive and bold interior design to our complimentary extras, we aim to have our clients time in the shop to be as satisfying as possible. Brusko Barbers aim to bring back the neighbourhood feeling of the barbershop where men meet up and discuss news, current affairs, sports and everything under the sun. We will foster a social community for men from different cultures who are linked by their common desire for great style, uniqueness and grooming. Have a cup or two of our great tasting Liberica coffee while polishing your shoes with our shoe shine machine when waiting for your appointment. Our work table is a shared space for our customers who want to work or have a short meeting. Our fast WIFI service is for you to use if you want to browse the web while relaxing. 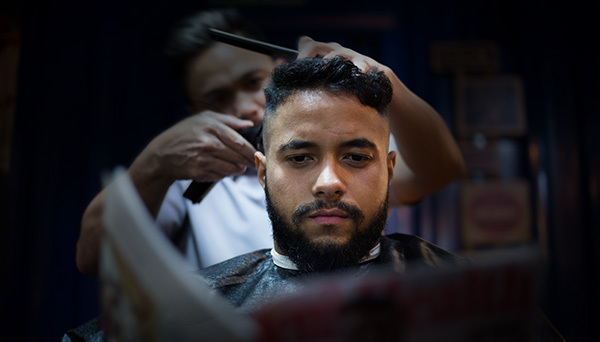 If you want to look your best whether for work, going out or just hanging out with friends, Brusko barbering services will make you look better and feeling great.